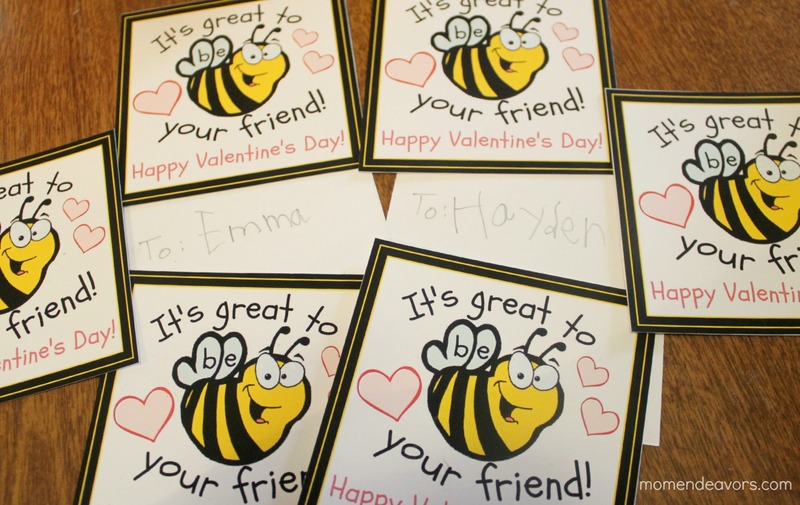 I’m so excited to share our bee valentines with you (along with the free downloadable printable) today! We spent some time this weekend working on Big Brother’s Valentine’s cards & Valentine’s mailbox for school this week! At his school, the Kindergarten classes each have a different animal theme and he just happens to be in the bee class! 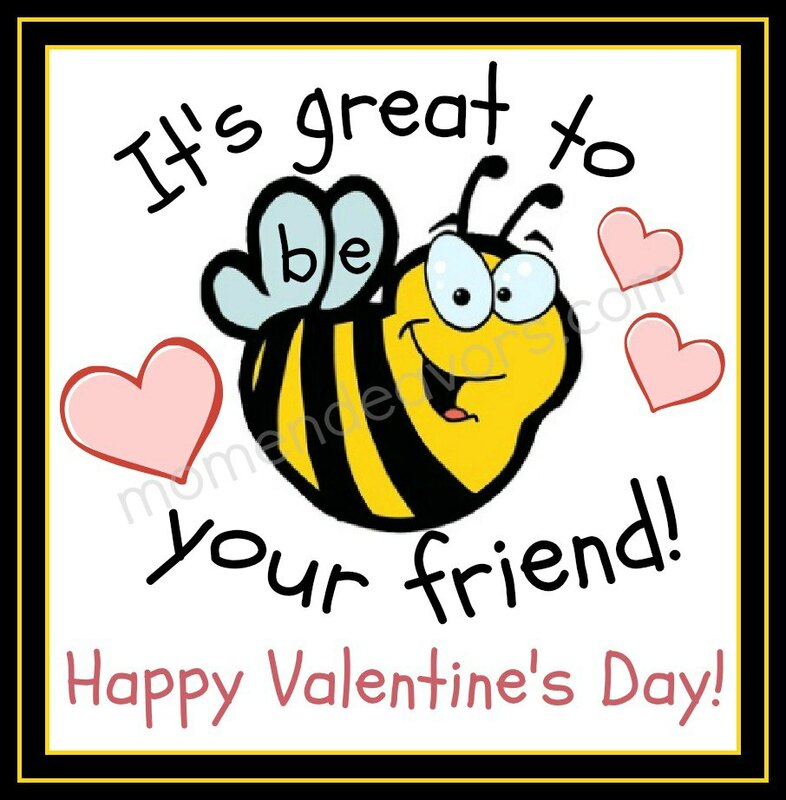 So, since he’s young and still into a bit more “cutesy” things, I thought it would be perfect to do a bee theme for his Valentine’s this year. But, just about everything I could find was something about “bee mine”. I personally don’t really like that phrase (even as an adult, let alone little kids), so I decided to just make our own! The inspiration came from the cute bee teacher gift we made for his first day of school. Instead of “bee mine” or anything similar, we decided on a nice, but simple “It’s great to be your friend”. Big Brother loves them! He is SO excited about the bee theme and for that, I’m so excited! We (Mr. Mom Endeavors & I) decided to not add on any candy or anything. Just the simple friendly message! So, I’m hoping he’s not the only one and he doesn’t feel left out/no one makes fun of him. Fingers crossed! But, for now he’s excited and he did great addressing them to all of his friends! His handwriting has been improving so much! After I created the cards (bee clipart found here), I just printed them on some white cardstock and cut them out with a paper cutter! Super easy! I was able to get 4 cards on each paper, so for a typical elementary class size, most people will only need to print 6 or 7 sheets! Not too bad! If you’d like to use these cards, just download the file from the link below. For best results, print on card stock or matte photo paper with your printer set to highest quality. 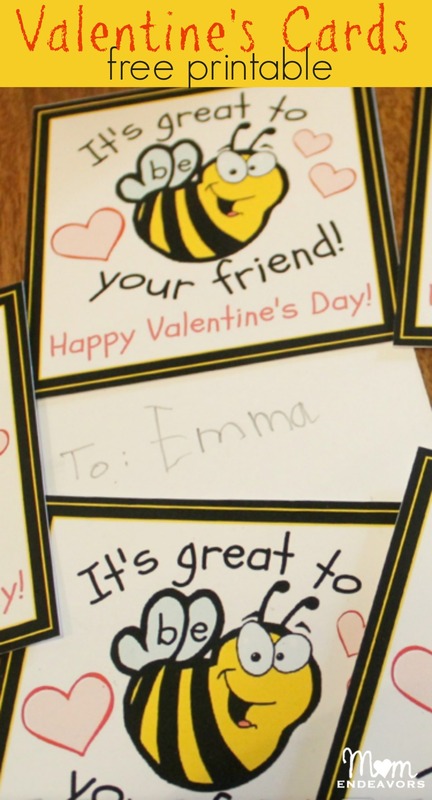 Thanks for “beeing” a reader of Mom Endeavors! Enjoy! Ha! Love it!! Thanks for BEEing my #1 commenter!!! I always look forward to your comments!! I am going to add honey sticks. Thank you.